In naming his second group of cardinals, Pope Francis has continued to shift the balance of the Roman Catholic Church’s leadership away from the continent it has long called home. The pope – the first modern pontiff born outside of Europe – announced 15 new cardinals on Jan. 4, including representatives from three Southeast Asian countries (Burma, Thailand and Vietnam) as well as New Zealand and the Pacific island nation of Tonga. Another three are from Latin America – Mexico, Uruguay and Panama – while two are natives of sub-Saharan Africa (Cape Verde and Ethiopia). Out of the 15 incoming “princes of the church,” only five are from Europe. In less than two years, Francis has changed the geographic breakdown of the cardinals. The conclave that elected Francis in 2013 was heavily European: 52% of those cardinals were from Europe, a continent that was home to only 24% of the world’s Catholics as of 2010. Based on the distribution of the global Catholic population, Europe is still overrepresented among cardinals who are under the age of 80 and therefore eligible to vote for a new pope. But Europe no longer has a majority. After the new cardinals are installed Feb. 14, Europe’s share of the 125 cardinal electors will have fallen to 46%. 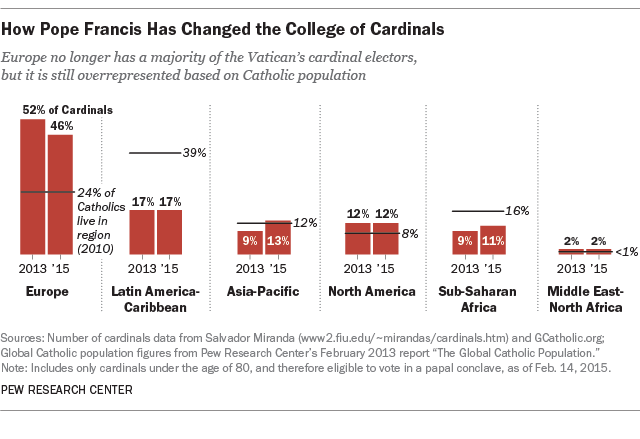 Meanwhile, Francis’ appointments have boosted voting-age cardinals from the Asia-Pacific region (from 9% in 2013 to 13% in 2015) and sub-Saharan Africa (from 9% to 11%).